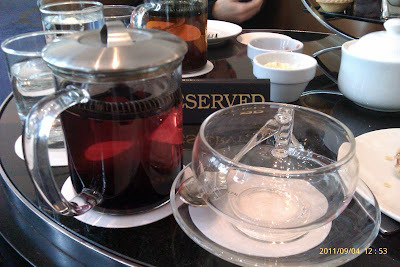 JWT and I had our monthly afternoon tea session last Sunday at The Westin on Collins Street. I actually prefer it to The Hotel Windsor afternoon tea... The Westin's afternoon tea is more value for money ($45 per person compared to Windsor's $79 pp), has an equally, if not more, exciting tea list, and runs from 12pm to 4pm - lots of time to chat and eat and sample different teas (Windsor's was strictly 2 hours long, and being the slow eater I am, I didn't have enough time to try everything - boo). Let's start with the teas - in the 3.5 hours that JWT and I sat there slowly working our way through the afternoon tea set (scones, sandwiches, etc. 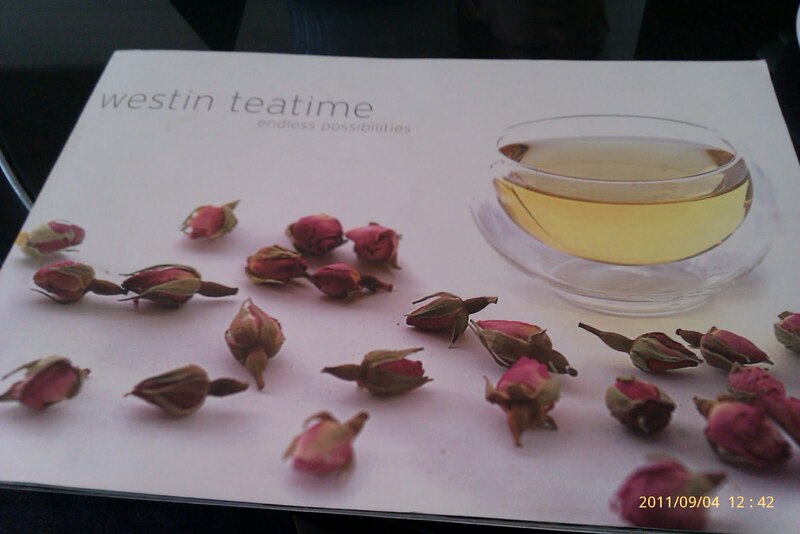 ), I managed to sample 3 different blends of tea from the Westin's tea menu. The first one I tried was the hibiscus and blackcurrant tea. This had the option of being served chilled or warm. I ordered the warm version as I was still recovering from a horrible cold/flu/randomviralthing. The tea was served in a clear diffuser pot with a giant clear teacup. The teacup was sooo cute! (Despite being giant-sized). It showed of the striking deep red colour of the tea - I already liked it the moment I saw that red! And the hibiscus and blackcurrant flavours worked very well together. I love flower-flavoured teas! The final tea I tried was the Westin blend... If I remember correctly, I think that's what it was called. I didn't like it that much - it had a strong grassy taste, not my cup of tea. Pun intended. I wish my stomach had more room in it. I was starting to get full after just having the scones!! The middle tier of the savoury stuff was very tasty - I managed to slowly make my way through the whole thing... But the dessert tier. What a struggle! Managed to finish the creme brulee, just had half the macaron to taste it, and only ate the fruits and a bit of the mascarpone on the tartlet. Did not even attempt the lemon tart - JWT told me it wasn't that great, so I didn't try to stuff myself with it. The scones were just the right size for me, and fluffy! The cranberry and raisin scones were a very good idea - made for an interesting scone that went very well with the clotted cream and strawberry jam. Yummay. The savoury items were put together very well. I would have happily had seconds of the egg sandwich and the ham, brie and semi-dried cherry tomato mini ciabatta, despite not having much room in my stomach. Sad to say, by this time I was too full to enjoy the dessert items properly. But this meant that my opinion of them would have been very objective! Right? And they were good desserts. The macaron was very tasty - good texture, nice shape and form, and the pistachio flavour wasn't too overpowering. I still like Adriano Zumbo's macarons the most though :p The cherry blackforest slice was probably the winner amongst the desserts for me - but I could only manage 2 mouthfuls! Oh the shameee. The other desserts, whilst tasty, didn't really stand out much - thus I shall not elaborate further on them. I'll just say they were good.